This Gold Tone CC Mini Cripple Creek banjo is a parlor or travel banjo that is absolutely adorable. 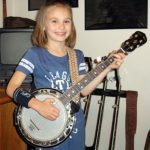 If you have a child who wants to learn the banjo, but doesn’t have the length in his or her arms and hands to play, this is a great banjo for learning. It’s an instrument that can be taken on the road whether you’re playing with a band or learning and want to play with friends. The versatility of this banjo is what makes it a great purchase. We love this cute, little parlor banjo for traveling. It’s called a parlor banjo because back in the day, people played these smaller banjos while they were home. This was a time where radio and television didn’t exist. Music was one of the only entertainments that people had. It’s a great banjo for playing bluegrass, and it’s the perfect banjo for traveling. You can easily jump on a plane with this banjo in a gig bag, slip it into the overhead compartment, and enjoy your banjo anywhere in the world. The makers of the Mini Cripple Creek is the Gold Tone Music Group. They boast a banjo for every player from beginners to professionals who spend their time on the road. They believe that music originates in the hearts of the players. All of the instruments made in their headquarters are created by talented luthiers in their Florida facility. The company takes pride in the fact that all their instruments are created right in their U.S. facility. They love their customers so much that they created an app that can help beginners who are learning to play the banjo. The app will help players learn songs faster. Each banjo that leaves any facility and is shipped directly to a player’s home will have to be set up properly. It’s the same process when a banjo is sent to a music shop except you will never see the banjo pre-setup because the music shop will do the tunings and such to the banjo. In its raw state, the banjo will need the bridge adjusted. It’ll require a tightening of every major geared tuner as well as the brackets and truss rod. It’s inevitable that each part of the banjo will need to be worked on before you can play the instrument. As soon as you receive the banjo, make it a point to bring it to be tuned and tightened at a music shop or with your teacher. The CC-Mini has a curly maple headstock as well as a hard maple neck. The materials in the miniature version are the same as those found in the bigger version of the banjo. The rim is an 8 inch maple with a brass tone ring. The company likes the brass tone ring because it’s perfect for that old-time bluegrass sound. This banjo is meant to be a travel banjo. While travel banjos can have a resonator, most of them are open back because it makes the instrument lighter. That’s the case with this banjo. It’s open back makes it incredibly light and easy to carry when traveling. You could easily bring it aboard an airplane or take it deep into the woods on your back. Either scenario won’t involve you breaking your back trying to travel with an instrument. When you receive the banjo, it’ll be tuned to open-C. This is a great tuning while you’re playing alone. You don’t need to worry about the tuning at all until you’ve been playing for some time and want to change to standard G tuning. You can take it to a shop to have the strings changed to .016, .034, .024, .019 and .016 for standard G.
The shipping weight of the banjo is 9 pounds, but the banjo weighs 4 pounds. What are the dimensions of the banjo? It’s 30.5 x 3.5 x 9 inches. How common is it to have to adjust the banjo for your playing style? Any musician knows that you’ll have to adjust for your particular playing style. That might take some time to learn if you’re a new player. Have a professional get it set up for you. This Gold Tone CC Mini Cripple Creek banjo is made of quality materials, and it’s a great instrument for those who are learning to play. The neck and frets are shorter than a traditional banjo, which is what makes it a good banjo for children to learn. It’s a great travel banjo since it’s incredibly lightweight with an open back as well as a shorter profile than a regular banjo.